She Writes Press, 9781631521317, 280pp. To honor her mother's deathbed advice to head off breast cancer to "be there" for her boys, Krista Hammerbacher Haapala chose to trade healthy breasts for longevity and peace of mind. In Body 2.0, Haapala chronicles the personal research, medical process, bodily changes, and the emotional toll involved in the more than two-year odyssey of what she referred to as her "Body 2.0 vision quest." Through it all, Haapala shares her insights for living awake during even the darkest times, and captures the raw ebbs and flows she and her family experience in the face of her wrenching decision. She takes on body image, the sexualization of breast cancer, motherhood, and maternal relationships, as well as how to sustain an intimate, loving partnership. 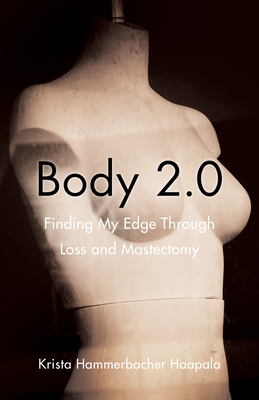 An unflinching, irreverent take on preventative double mastectomy, Body 2.0 is a guide to reframing adversity, finding inspiration, and shaping your own life.